Terry Bogard (テリー・ボガード) is an American fighter and the older brother of Andy Bogard. He is often referred to as the Legendary Hungry Wolf (from Garou Densetsu, meaning Legend of the Hungry Wolf). Terry's appears in the first 3 on 3 KOF Tournament in The King of Fighters '94, where he serves as the leader of the game's Fatal Fury team alongside his younger brother Andy and Joe Higashi. Although the King of Fighters Tournament was originally created around the characters from the Fatal Fury and the Art of Fighting games, the whole Fatal Fury Team doesn't really have a lot of story in the original Orochi saga. Their only goal seems to be to seek revenge against Geese Howard for the death of Jeff Bogard. 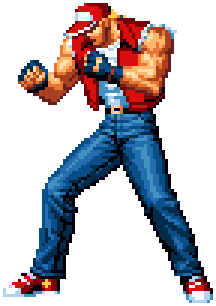 Since he is one of SNK's most famous characters, Terry Bogard has appeard in every single KOF game so far (as well as in every single Fatal Fury game). This page was last edited on 10 July 2009, at 02:57.